Richard Long at the Judd Foundation | The Bottom Line "The Drawing Center"
Since the late 1960s, the ground floor of 101 Spring Street, the five-story, cast-iron building where Donald Judd lived with his family, has been used as an exhibition space for both artworks in Judd’s collection and examples of the artist’s own work. 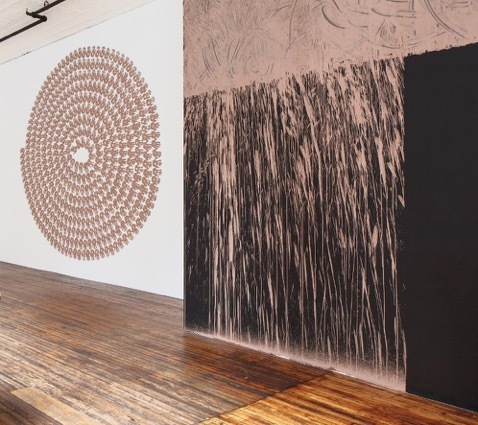 This fall, a new installation by British artist Richard Long has been commissioned for the space as part of a series of exhibitions curated by Judd’s son, Flavin. Long and Judd met in 1988 at an exhibition in Reykjavik, Iceland. After their first meeting, Judd acquired Long’s Sea Lava Circles, a large-scale installation made from consecutive rings of volcanic rock (now on view at The Chinati Foundation in Marfa, TX). Though Long and Judd maintained very different practices, the two artists revolutionized the field of sculpture. Long, whose approach to artmaking is expressively performative, creates installations that engage with nature both as subject and medium, working solely with raw materials (and often just his own body). Judd’s work, by contrast, is marked by the explicit absence of gestural marks and the use of highly finished, industrial materials and processes. Differences aside, both Long and Judd share a heightened awareness of the context of their installations, creating work that is intimately connected to its environment whether on view in a remote outdoor space or in a traditional gallery. Both artists also use elemental geometric forms and rely on processes and materials that question the commercial value of artworks. For the present exhibition at 101 Spring Street, Long created two large-scale wall hangings made from terracotta slip, a technique he began using in the early 1980s. Entitled Friendships and Fall on Spring, the two works cover the length of the Soho building, spanning nearly 60 feet. They showcase how Long’s multifaceted practice is grounded on his physical encounter with the natural world, often combining the counter forces of nature and human creation. 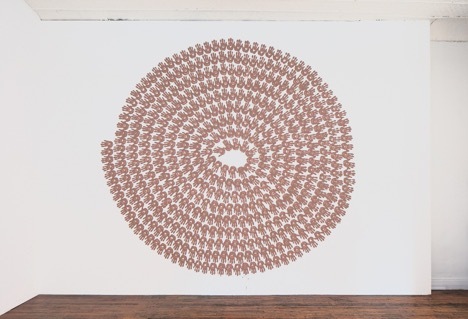 Friendships consists of a coiled circle formed by a series of concentric hands prints. While the title alludes to the relationship between Long and Judd, the tactile surfaces of the individual clay pieces and the provisional nature of their installation speak to the differences between the two artists, challenging Judd’s resolute removal of the artist’s hand. Chance plays a crucial role in Long’s artistic practice, and this is particularly visible in Fall on Spring in which the ordered composition of the work is balanced by the spontaneous character of its execution. The artist applied terracotta slip to the top half of the wall piece with his hands using swirling movements. 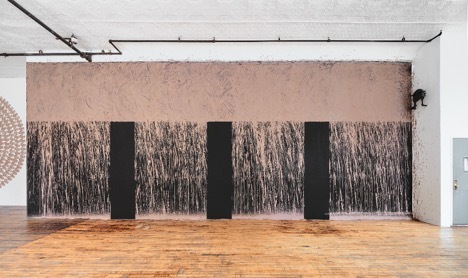 The bottom half of the piece is a result of gravity acting on the medium: drips of terracotta stream down the wall, obscuring the dark ground of the work. Although Long’s waterfalls are typically continuous, when creating Fall on Spring the architecture of 101 Spring Street interrupts the flowing terracotta creating a pattern as the medium hits the floor and the wall moulding. In Fall and Spring, it can be said that Long engages once again in an unspoken dialogue with Judd by responding to the artist’s former home. The exhibition is on view at the Judd Foundation on 101 Spring Street until December 17th 2016, and is open to the public on Thursdays, Fridays, and Saturdays from 1:00pm to 5:30pm. The installation of Long’s work is part of an ongoing series that explores the relationship between Judd’s work and that of his contemporaries.